What do you think about when you hear the term SEO copywriting? Do you think it’s about popping keywords into existing web pages, so Google will see them and rank them in its search engine results pages? But then again, if it were, you’d soon get bored of reading keyword stuffed, spammy pages. Fortunately, SEO copywriting is not about stuffing keywords into weak content. In fact, Google has released plenty of algorithms to weed this poor content out. SEO copywriting is about creating high-quality content, written to achieve your business objectives. Also, it’s about writing web pages and content in language your audience speaks so that search engines can find it. Consequently, if your high-value content gains the trust and recognition of your audience and influencers, it makes sense for Google also to trust it and to boost your authority by way of natural (unpaid) rankings. 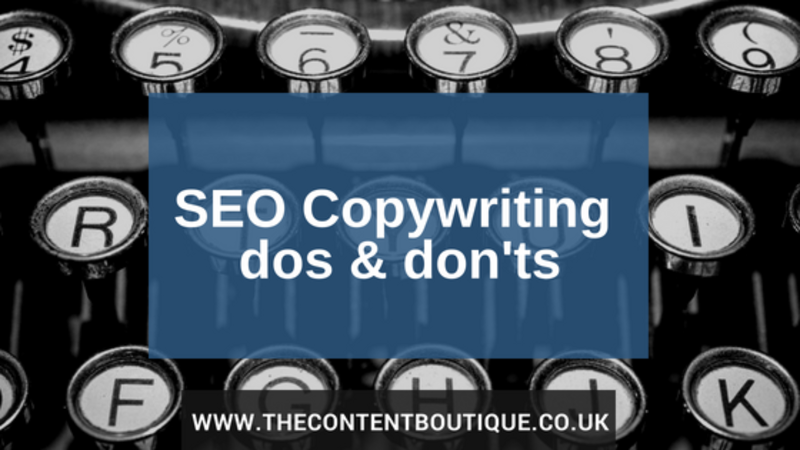 So what are the true dos and don’ts of SEO copywriting? Your action: Do your research. Find out what your potential customer’s intent is when it uses the Internet to find answers to questions. User intent brings me neatly onto this next point. There’s nothing more frustrating than typing in a search query, clicking on a link in the search results and then being taken to a page that has nothing to do with your original question. Your action: Write unique meta titles for each of your pages. Include keywords that match the content on your page. Meta titles are the first line of copy a searcher sees in the search results. So you’ll want to make sure the searcher clicks on your titles over others in the search engine results pages. Your action: Grab reader’s attention by writing keyword and benefit rich titles in the style of a headline. Don’t try to be smart. Clear and inviting is best. Sometimes Google returns snippets from your page content in your search results. Other times it returns your meta description. Here’s the thing, you never know when Google is going to return page snippets in its search results. And this is not new. Your action: Always err on the side of caution, and write a keyword and benefit rich meta description. Use the opportunity to expand on your meta title (headline) promise. Today you have up to 320 characters in which to do so. Some people will tell you keyword research is dead. But I would argue, Google isn’t that smart yet. When trying to identify a searcher’s intent, Google still relies on keywords to point it in the right direction. Your action: Research keywords relevant to what a searcher would use to find each page. You can choose between paid and free tools to help you do this. Ubersuggest is a great free tool. But what if you are a B2B company and your search terms don’t generate results from the keyword tools? Then you need to be a bit savvier. Check out social media and forums where your customers hang out. Note down the language they use when talking about your products/services. Also, check out your competition. And now for the don’ts. While it is important to use keywords, do not under any circumstances be tempted to stuff your page copy with them. You’ll put readers off. And as I said before, Google is wise to this trick and as a result, penalises people who do it. You’ve heard the term content is king. And you’ve been told Google loves fresh content. But that doesn’t mean you should churn out poor quality content just to appease the search engines. The searcher always takes priority. And what the searcher wants is answers to questions. Recently, I’ve had some companies contact me, compliment me on a blog I’ve written, then ask me to insert random links into my posts, so that they get a backlink. Why would I agree to pollute my hard work with links entirely irrelevant to my copy? A better strategy is to write high-quality content that answers your searcher’s questions and therefore naturally attracts links. Of course, if you include relevant outbound links to influencers in your page copy, then you are entirely within your right to share your copy to those influencers. If they can see what’s in it for them by you including a link to them in your text, they’ll be far more likely to give you a backlink. You’ve probably heard Google loves long-form content, but that doesn’t mean you should pad out your copy to fill a word count. A bloated page is hard for search engines to crawl. A better strategy is to write long-form copy that is sharp as well as easy to read and understand. You’re aware that mobile has overtaken desktop as the primary device used to access the Internet? So it goes without saying you need to take into account your mobile readers. To optimise your pages for mobile, keep sentences and paragraphs short. Use bullet points to help readers scan and digest information. Make it easy for readers to take the next step. Include strong directions and call to actions. As with anything you do, it pays dividends to measure your performance. Keep an eye on your analytics so that you can get a sense of how well your audience and search engines respond to your page content. Use the insights to fine-tune your copy. So there you have it. SEO copywriting is pretty obvious when you think about it. If you would like help with SEO copywriting, then drop me a line to get information about pricing.